Live performance and video works. Narcissister is an American artist based in Brooklyn who works in live performance, video, and photography to explore issues of gender, racial identity, and sexuality. Through eroticism and humor, Narcissister questions fetishism and related fixed racial and gendering stereotypes. Narcissister wears a mask in all performances, videos, and photographs. The mask, representative of a narrow conception of femininity and beauty, draws the viewer in while simultaneously establishing a clear degree of separation between artist and viewer. Narcissister has presented work at The New Museum, MoMA PS 1, The Kitchen, and at Abrons Art Center. 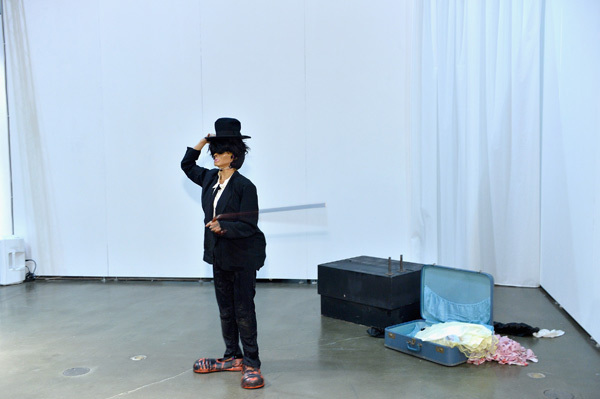 In 2011, Narcissister was selected as a re-performer of Marina Abramovic’s Luminosity piece as part of MoMA’s “The Artist is Present” retrospective. Narcissister has also presented internationally at the Music Biennale in Zagreb, Croatia, at Chicks on Speed’s Girl Monster Festival, at The City of Women Festival in Ljubljana, Slovenia, at Copenhagen’s first live art festival Warehouse 9, and at the Camp/Anti-Camp festival in Berlin, among many others. Her art videos have been included in exhibitions and film festivals worldwide, including on MocaTV. Narcissister performed in FORE at The Studio Museum and had her first solo gallery exhibition in February 2013. She was nominated for a 2013 Bessie Award for her evening-length piece “Organ Player” which debuted at Abrons Art Center. Narcissister is a 2015 Creative Capital Fellow, a 2015 Theo Westernberger Grantee, and a 2015 United States Artists Fellow. Narcissister will be performing live and presenting video works, curated by Ace Gallery, at the 2017 Los Angeles Art Show.